They are both “central to the story of the Bible” (p11-12). It does not dismiss the significance of Israel in the storyline. They both “continue to have theological significance” (p12). Israel does not cease to exist theologically after the birth of the church or AD70. The return of Jews to Israel to the ancient land of Israel is “part of the fulfillment of biblical prophecy” (p12, emphasis original). This emphasized point is significant. The authors are not saying that any one OT prophecy is completely fulfilled in Jews moving to the modern state of Israel; but rather that it is prophetically significant. The Jews “need and deserve a homeland in Israel” (p12). Given the modern distaste and even disgust for Zionism, McDermott is quick to set out what it is not. It is not to be confused with dispensationalism and a specific detailed end-times forecast. Instead, it “looks to a long history of Christian Zionists who lived long before the rise of dispensationalism” (p11). Though I find this distinction a little overstated, given that at least two of the authors are progressive dispensationalists, the point is still received. The New Christian Zionism does not depend on a particular Israel-church distinction or end-times schedule. Moreover, it is not merely nationalism, due to the historical presence of Jews. Nor merely Christian, but shared with ancient rabbinic opinion. Nor is it about land theft, racism or establishing a theocracy. The case of The New Christian Zionism takes consists of several stages. First are two historical chapters from McDermott. Chapter 1 provides a brief history of supersessionism and its three varieties: punitive, economic and structural. The first is that God utterly rejected Israel for not accepting Christ. The second is that Israel’s purpose consisted of bringing the Messiah, and so is now irrelevant. The third is that Israel is not central to Scriptures’ story, and served merely as a negative example. Chapter 2 traces the history of Christian Zionism beginning with the Bible and continuing to the modern day. Part 2, Chapters 3-6, turn to the fundamental and Biblical case for the New Christian Zionism. In chapter 3, Craig Blaising addresses the hermeneutical questions of how to relate the OT to the NT, how to relate Israel to the church, and how to think about the present state of Israel. As to the latter, Blaising considers Israel’s rebirth and regathering as a “preconsummate” work of God. That is, it is providential but only a partial fulfillment of prophecy. In chapter 4, Joel Willitts posits several arguments that Matthew’s Gospel presupposes the restoration of Israel. Mark Kinzer, in chapter 5, responds to claims that Luke-Acts displays a theological shift away from Jerusalem’s centrality, and thus has no future for Israel. David Rudolph treats Paul’s letters in chapter 6, showing that Paul’s eschatology is Israel-focused. Part 3 moves from Biblical foundations to address specific issues in Christian Zionism. In chapter 7, Mark Tooley traces and responds to the development of Protestant mainline supersessionism in recent decades. In chapter 8, Robert Benne finds parallels between Reinhold Niebuhr’s era and our own. Robert Nicholson, in chapter 9, evaluates Israel’s adherence to international law; arguing that though they are not perfect, they consistently hold themselves to a higher standard than surrounding countries and even leading Western nations. In chapter 10, Shadi Khalloul, himself a Aramean, defends Israel against accusations of unfairness towards minorities. In chapter 11, Darrell Bock suggests six emphases must be pursued to retain balance in the movement. First, the centrality of Christ must not be lost. Second, the promises to Israel must not be forgotten. Third, Christian Zionists must not become nationalistic. Fourth and fifth, reconciliation and justice between Jew and Gentile must be emphasized. Sixth, the “international and legal right” (p314) of Israel to the land must be understood and articulated well. In chapter 12, McDermott discusses implications of New Christian Zionism to hermeneutics, exegesis, historical theology, systematic theology, political theology and Jewish-Christian dialogue. First, I am glad to see a book like this published. Christian Zionism is unpopular, especially in the academic community, so I commend IVP for giving this position a chance to be heard. I suspect it was the fear of being overlooked that led the authors to distance themselves from their allies in dispensationalism. However, they are correct to maintain the movements’ broad compatability. A case for Christian Zionism requires a multi-directional defense, and gladly the authors recognize this. However, since this is a Biblical studies blog, I was most interested in the Biblical case in chapters 3-6. I was very pleased by the choice of authors, as each is a solid and forward-thinking scholar in their own right, and Kinzer and Rudolph are both leading messianic Jewish scholars. Each gave a fresh and compelling case that deserves to be read. The authors are to be commended for not overplaying their rhetorical or polemic hands. However, Craig Blaising let down the team when he dismissed a popular reading of Matthew’s Gospel as “[belonging] to an anti-Semitic, anti-Judaic interpretation of Matthew that is generally rejected today” (p84). This is poisoning the well instead of humbly allowing a viewpoint to be heard and respectfully assessed. Fellow believers in Christ deserve better. I was disappointed at three missed opportunities. First, I was surprised little was said to defend and articulate the future prophecies remaining for Israel. A chapter devoted to OT promises, and their lack of (complete) fulfillment in the NT would have been helpful. Blasing’s chapter on hermeneutics would have been an appropriate place to do so. Also helpful would have been more clarity on how to interpret national Israel today in light of Biblical prophecy, since the authors do not simply state that the eschatological regathering promises are fulfilled. Second, Hebrews is regularly used to argue for a supersessionist viewpoint, so it was a mistake to have no chapter devoted to the letter. Third, a chapter by someone like Brian Tucker on the relationship between Jew and Gentile in the church. By showing the ongoing diversity within Christ’s body (e.g. 1 Cor 7:17-20), a continuing concern for Israel’s future is bolstered (Rom 11:1). And how should we think of Jewish believers today. It seems to me that many Christians, whatever their eschatological outlook, expect Jews to effectively become Gentiles when they come to Christ in this age. The New Christian Zionism reveals a scholarly voice that, whether one agrees in the end, deserves to be heard. This is a voice that does not defend national Israel blindly, nor does it downplay Christian status by envying unbelieving Jews or interpret with the newspaper rather than the Scriptures (I have seen these traits more than I wish to admit). Rather, this is a Christian Zionism that is intellectually robust, historically aware, Scripturally grounded, and ethically sensitive. This is also a Christian Zionism that does not require a rigid eschatological system. This viewpoint can be held by any believer. In other words, this is not your father’s Christian Zionism, though it may be your great-grandfather’s. 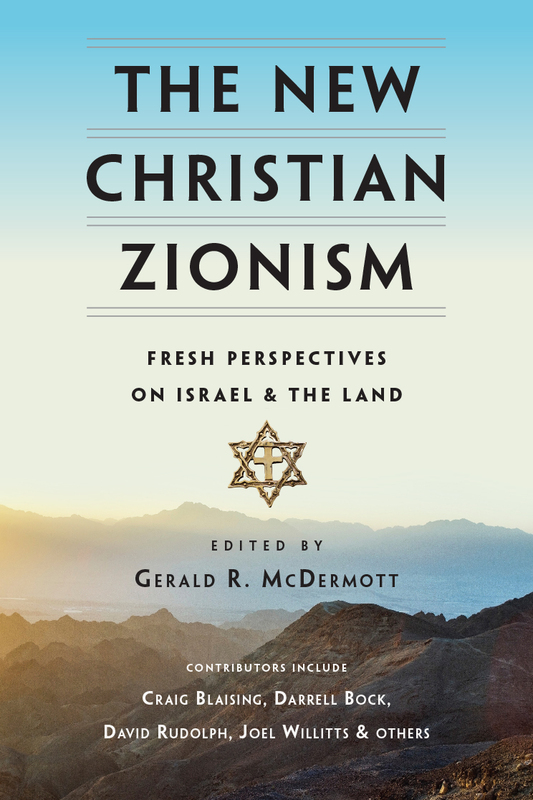 The authors have presented a positive and defensive case for a thoughtful Zionism for all Christians. Many ttanks to IVP Academic for providing a review copy. Buy The New Christian Zionism from Amazon.